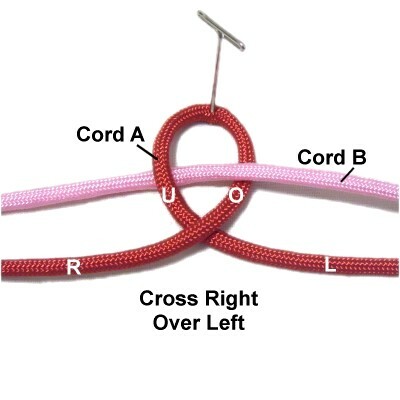 Description: The Tumbling Hearts bar is a unique way of using Square knots. The heart shaped designs alternate direction. This design is wider than most Square Knot sennits due to the picots that form the heart shapes, so it can be used as a belt. An interesting Wreath can also be made simply by adding wire to help the sennit stay circular. 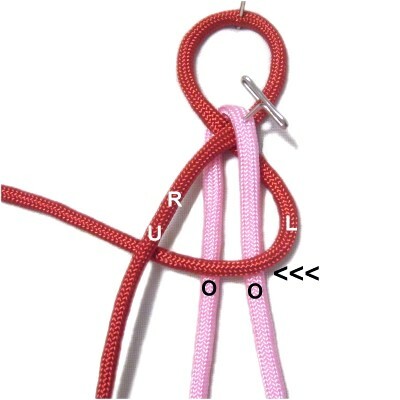 This interesting knot is listed on the Fusion Knots website, so click on the image or link to visit. 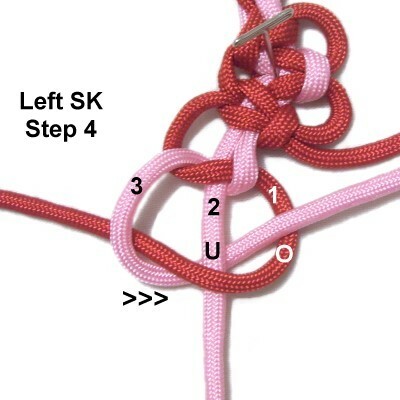 The video gallery is a great way to learn unique combination knots and techniques. 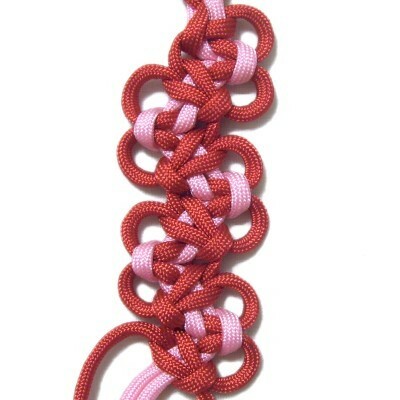 To practice the Tumbling Hearts Bar, cut one cord of each color, at least 60 inches long. Mentally label them Cord A and Cord B. The cords should be at least 11 x the finished length you want to make, when using this design in a Macrame project. Prepare the tips to prevent unraveling. 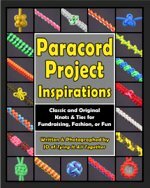 See Cord Preparation to learn how to treat the tips if you use Paracord, which is the material shown. 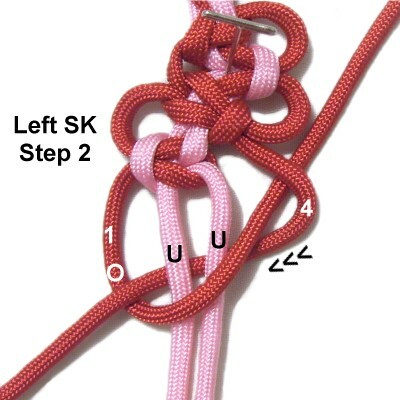 Step 1: Fold Cord A in half and cross the ends right over left to form a loop. Secure it at the center. Slide Cord B through the loop under - over as shown. 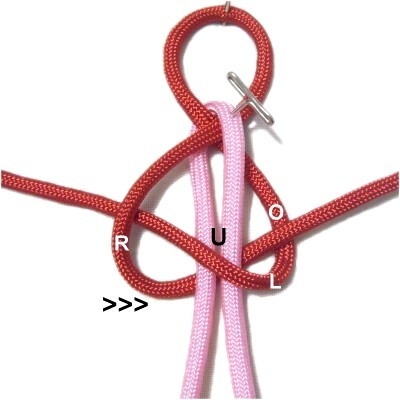 Fold Cord B around the crossed area of the loop. The right half of it should pass over the front. Match the ends and balance the cord. Secure it at the center, which should be at the crossed area. 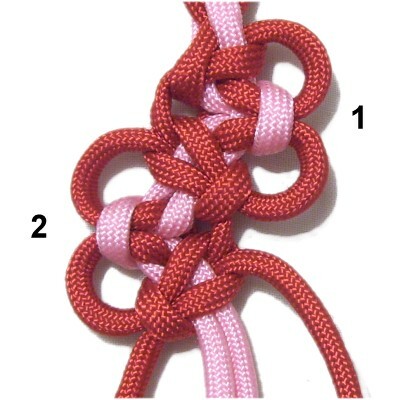 Step 2: Move the left half of Cord A towards the left, passing over Cord B. Bring it under the right half of Cord A. Move the right half of Cord A under Cord B, heading right. Pull it out on the right, passing it over the left half of Cord A. 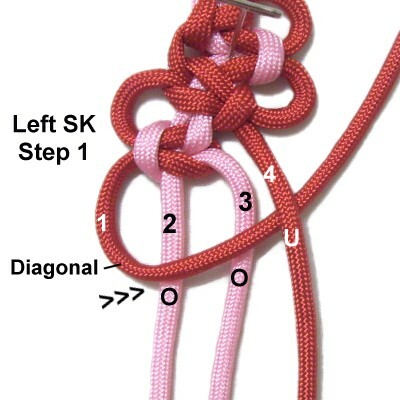 Adjust the size of the loop and tighten the knot firmly. Step 3: Mentally label the cords 1 - 4. 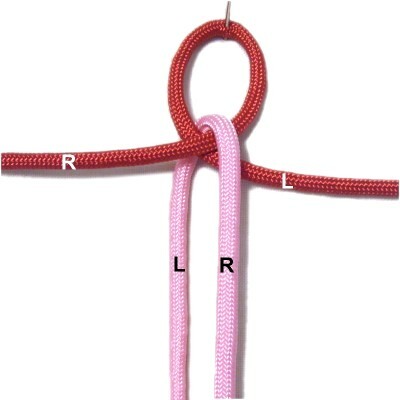 The first RIGHT Square knot for the Tumbling Hearts Bar is tied with Cords 2 - 4. Do not use cord 1. Move Cord 4 to the left, passing it over Cord 3 and under Cord 2. 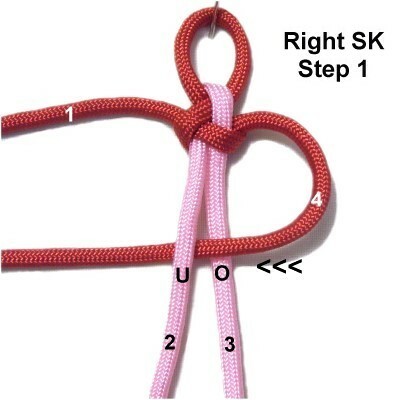 To complete the first half of the SK, move Cord 2 under Cord 3. Pull it out on the right, passing over Cord 4. 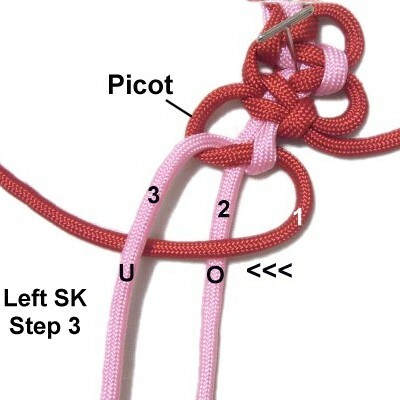 Tighten the knot, leaving the outer portion of Cord 4 loose, forming a picot. Cord 2 should be completely tightened on the left. Step 4: Move Cord 4 to the right, passing over Cord 3 and under Cord 2. 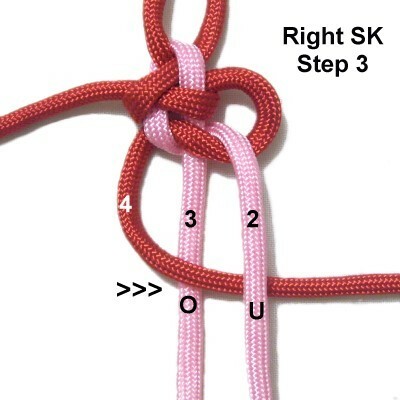 To complete the SK, move Cord 2 to the left, passing it under Cord 3. As you pull it out on the left, bring it over Cord 4. 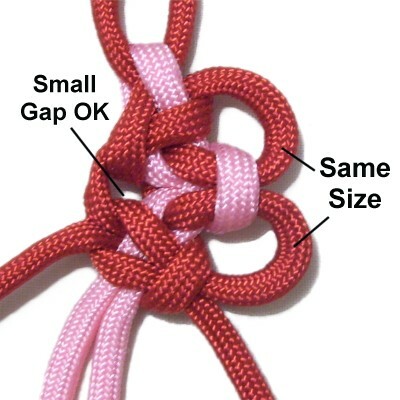 Tighten the Square Knot firmly while holding the picot so it remains loose. 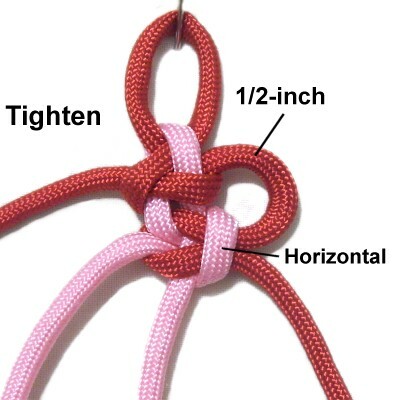 Measure the picot to make sure it's close to 1/2-inch in size. Make adjustments if needed. 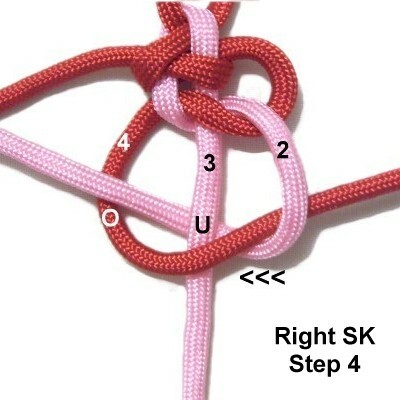 Step 5: The next RIGHT Square knot for the Tumbling Hearts Bar is tied with four cords rather than three. It's also diagonal, with the narrow angle on the left. Move Cord 4 to the left, passing over Cords 2 - 3 and under Cord 1. To complete the first half of the SK, move Cord 1 under Cords 2 and 3. As you pull it out on the right, pass it over Cord 4. 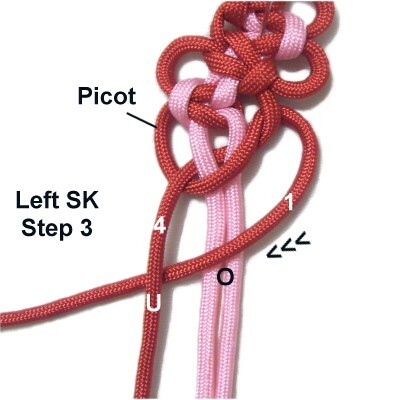 Tighten the knot slightly, forming a picot with Cord 4 on the right. It should be 1/2-inch in size, so it matches the first picot. Step 6: To start the second half, move Cord 4 over Cords 2 and 3 and under Cord 1. Keep the same diagonal slant as in the first half of the SK. 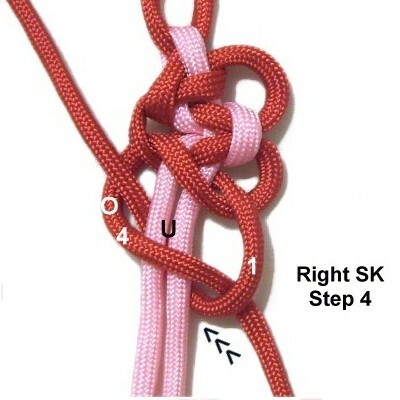 To complete the SK, move Cord 1 to the left, passing it under Cords 2 and 3. Pull it out on the left, passing over Cord 4. Keep the same diagonal slant. Tighten the SK slowly, making sure the picot loop on the right (Cord 1) is still 1/2-inch in size. Both picots should be round. It's OK if there is a small gap on the left, as long as the design looks like a heart. 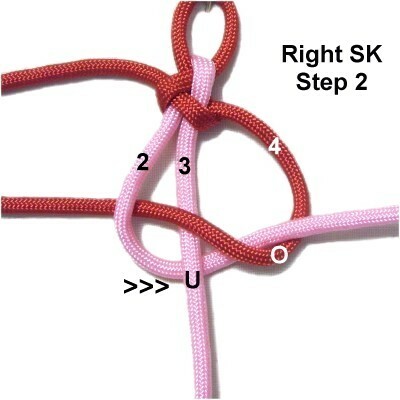 Important: As you continue, remember that the first SK is horizontal and the second one is diagonal. The heart shape is determined by these changes in direction, so be sure to focus on getting them right. The Tumbling Hearts Bar will look much neater if you are careful with positioning. 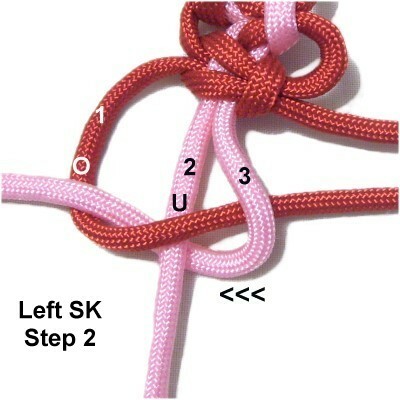 Start a LEFT SK by moving Cord 1 to the right, passing it over Cord 2 and under Cord 3. Do not use cord 4. 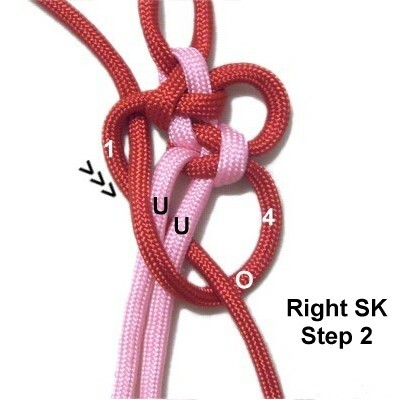 Complete the first half of the SK by moving Cord 3 under Cord 2. Pull it out on the left, passing over Cord 1. Pull the curved part of Cord 1 to the left as you tighten, to form a 1/2-inch picot loop. Step 8: Move Cord 1 to the left, over Cord 2 and under Cord 3. To complete the SK, move Cord 3 under Cord 2. Pull it out on the right, passing over Cord 1. 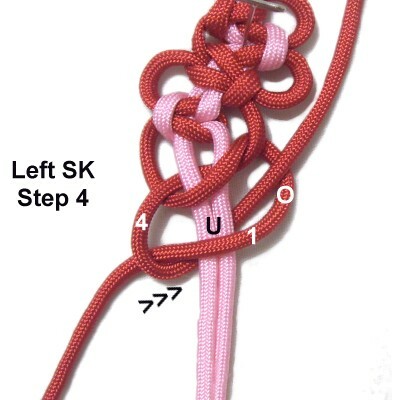 Tighten the SK firmly while holding the picot loop, so it remains loose. Make sure it's 1/2-inch in size, so this heart matches the first one. 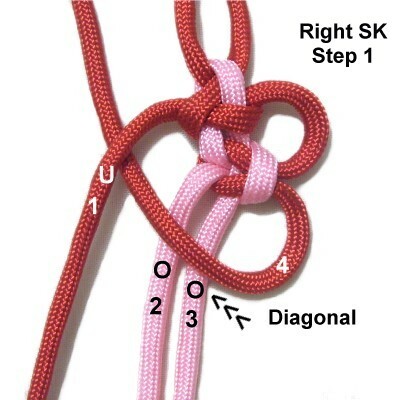 Step 9: The next LEFT SK for the Tumbling Hearts Bar is diagonal, and is made with 4 cords. Move Cord 1 to the right, over cords 2 and 3, and under cord 4. To complete the first half of the SK, move Cord 4 under Cords 2 and 3. As you pull it out on the left, move it over Cord 1. 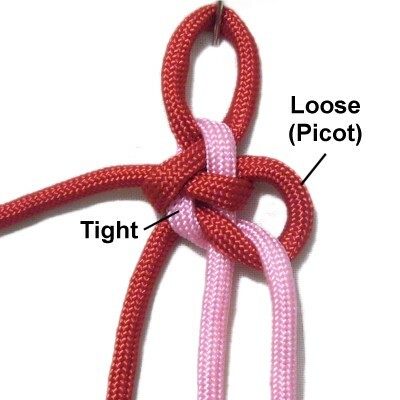 Tighten the knot slightly, forming a picot with Cord 1 (left). Step 10: Move Cord 1 to the left diagonally, over Cords 2 - 3 and under Cord 4. Complete the SK by moving Cord 4 under Cords 2 - 3 and over Cord 1 as you pull it out on the right. Tighten the second heart carefully, making sure the two picots on the left are the same size. 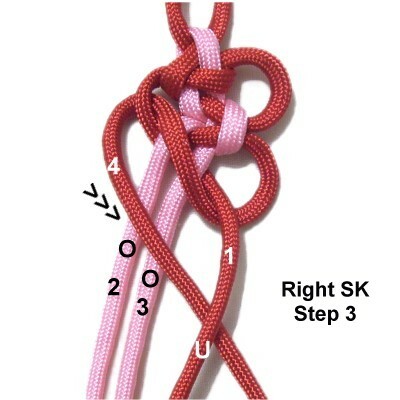 Also check the direction of the Square knots, especially the first one (horizontal). Step 11: Repeat steps 3 - 6 to make Heart 3. Repeat steps 7 - 10 to make Heart 4. You can repeat again if you have enough material. (Optional) Finish off the ends of Cord A by sliding them under loops in the BACK of the bar. Apply glue and cut off the excess material. 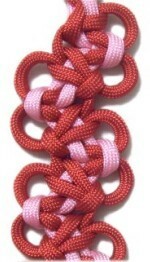 To make a Button Knot clasp for the Tumbling Hearts Bar, you would do so with Cord B. 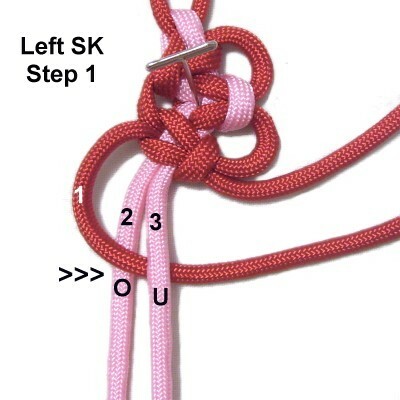 The best technique is the Knife Knot, also called the Diamond Knot, which can be made with two cords. Have any comments about the Tumbling Hearts Bar? Contact Me.